October 1, 2012 - Atlanta. State Representative Scott Holcomb (D-Atlanta), was named by Georgia Trend Magazine as one of its 40 under 40 Honorees for 2012. Each year the Georgia Trend editorial staff selects 40 high-achieving Georgians under the age of 40 who are influencing the state's future in business, government, education, the arts and charitable organizations. Georgia Trend published its annual list of rising stars today. It is available online here at Georgia Trend. "It's an honor to be recognized by Georgia Trend as one of its 40 under 40 for 2012. Leadership from our generation can change Georgia for the better. We've been raised in a world where ideas circle the globe in the blink of an eye. We've been forced to understand that our challenges are global. I believe global competition brings huge opportunities for our state. We need to seize those opportunities." said Holcomb. Holcomb was elected in 2010 and was named a Deputy Whip as a freshman. He served on the Defense and Veterans Affairs Committee, Public Safety and Homeland Security Committee, and the Children and Youth Committee. 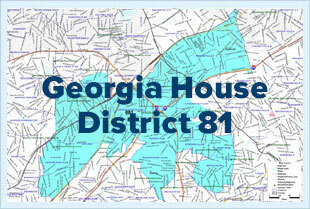 Holcomb is the incumbent for House District 81, which includes the cities of Chamblee and Doraville, as well as portions of Northlake, Tucker, and Brookhaven in DeKalb County, and a portion of southern Gwinnett County. An attorney with more than a decade of experience, he began his career with the U.S. Army JAG Corps and deployed overseas three times from 2000-2003. He earned numerous honors and awards for his military service. Following his military career, he practiced law at one of Atlanta's most prestigious law firms and was twice recognized as a "Rising Star" by Georgia Super Lawyers Magazine. He has taught part-time at Georgia Tech and is currently enrolled in the Executive MBA program at the University of Georgia. He volunteers his time to provide pro bono legal representation to veterans and their families and he also serves on the boards of several nonprofits. Holcomb lives in the Northlake area with his wife Kathleen and their two children, Carter and Kirsten. The family attends Immaculate Heart of Mary Church.